Jayden Moseley went camping up towards Lake Eildon. Jayden spent time casting spinner baits towards the banks and then trolling the lake with great rewards. 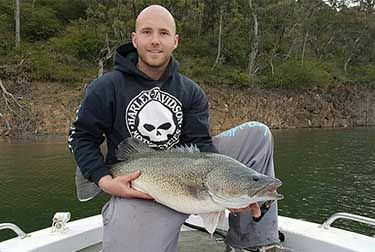 Jayden catching several magnificent Murray Cod up to a meter long. Jayden also caught some nice Trout whilst trolling. At evening he was camped by the beautiful surroundings as shown in the picture. Well done Jayden.